Those disappointed to see only B.D. Wong return from the original Jurassic Park in this summer's true sequel Jurassic World will be happy to know that there is a bigger, more ferocious icon returning to cinemas in this latest franchise adventure. No, it's not Jeff Goldblum or Laura Dern in a surprise cameo. It's the T-Rex! The exact same T-Rex as seen in the original movie. 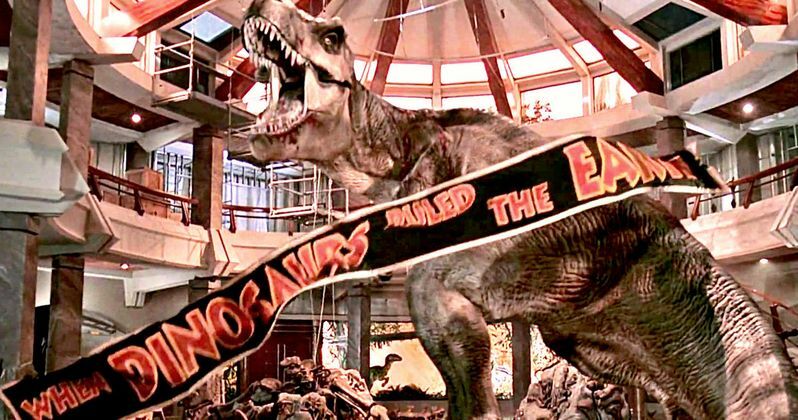 "The T. Rex in this movie is the same T. Rex from Jurassic Park. ... She's been on the island for 22 years. She's still alive. She's a little older, and she's angry." When dinosaurs ruled the world, indeed! It seems quite a few of the animals living on Isla Nublar have been there since the events in the original film, with the park being built around them. While Universal and Colin Trevorrow were originally intent on keeping their new dinosaur Indominus Rex out of publicity materials before the premiere, an online toy and merchandizing leak forced their hand. Yet, they still have not given us the glory shot of the T-Rex, and probably won't until after the film opens. Some speculate that she won't even come into play until the 3rd act, when the T-Rex arrives to save the day. But that might be a little too on the nose for a director such as Colin Trevorrow, who likes to offer an unexpected twist. Phil Tippet, the man who supervised the creation of the dinosaurs in the first Jurassic Park is returning. Though its unclear how much CGI there will be versus practical effects. But a change from the original movie is that all of the Velociraptors are actually actors wearing motion-capture suits. This allows the animals to move in a unique way. We'll just have to wait until June 12 to see these monsters come alive on the big screen like never before. What do you think? Are you glad to see the original T-Rex has survived all these years?